Since the State of Israel was established, its labor force has grown rapidly and has become increasingly diverse in terms of its demographic, cultural, ethnic, and socioeconomic characteristics. Israeli work values have shifted towards greater individualism, materialism, careerism, and preference for white-collar and knowledge-based occupations is evident. A major structural change is underway, as indicated by the decline of agriculture as a component in the Israeli economy and the growth of the industrial sector--mostly towards high technology and innovative enterprises.This volume sheds light on trends and developments that have been taking place in the realm of work in Israel in recent years. 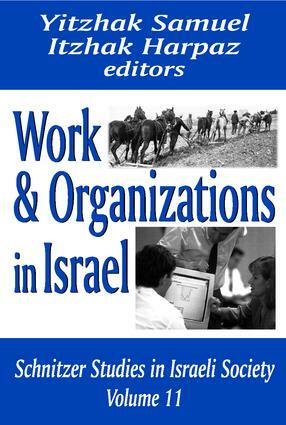 It contains a unique selection of articles presenting empirical evidence of the major features and important changes characterizing work organizations and the regime of work in Israeli society: labor relations, work values, power and management in organizations, work in the Kibbutz, inter-organizational relations, women and work, migrants and minorities in the Israeli labor force. Studies show that another two major trends characterize the contemporary economy and the labor market: the trend toward privatization and globalization, the results of which are a continuous decrease of job security and an increasing level of unemployed Israeli men and women that are replaced by the low-cost labor of foreign workers emigrating from third world countries.This timely volume is valuable for its contribution to illuminating the recent changes taking place in the realm of work in Israel, and will be of interest to sociologists, social scientists, and students of Judaica. Gender-Based Wage and Promotion Discrimination in Israeli High-Technology Firms: Do Unions Make a Difference?